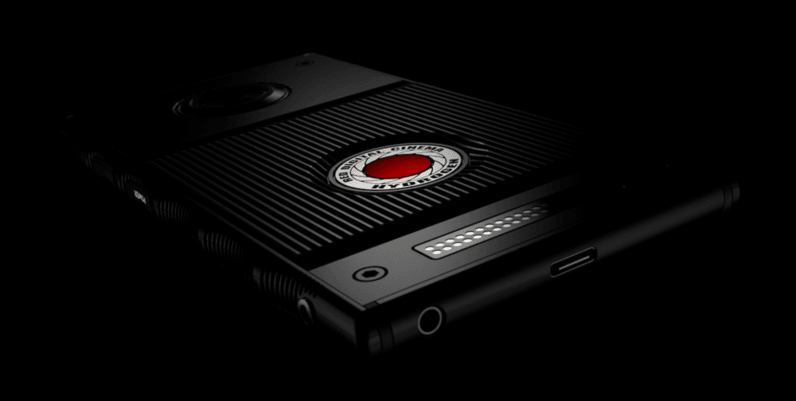 RED is one of the biggest names in professional film cameras, but now the company is branching out… into smartphones. Specifically, a $1,195 modular smartphone coming out next year, with virtually no known specs. Umm, okay then. Pretty much the only important spec we know about the RED Hydrogen, as the phone is called, is that there’s a 5.7-inch “professional holographic display.” That sounds a lot like the stereoscopic display on the old HTC Evo 3D (or Nintendo 3DS, for a more recent example), though it will presumably have better quality. The only other specs in RED’s press release are a USB-C port, a microSD slot, and some metal contacts for modules akin to the Moto Z series. That doesn’t exactly tell us much. It also sounds like the resolution is compromised while in 3D mode. That’s generally the case with these stereoscopic displays, but it would’ve been nice if RED could have at least mentioned the native resolution in the first place. The phone is clearly a niche device aimed at RED users, what with the ability to serve as a camera monitor and play back RED file formats, as well as handling ambiguous “VR, AR, and MR” content. Still, that at least implies it will have flagship specs, given the performance requirement of high-end 4K footage and decent VR experiences. Of course, one would hope for flagship specs at $1,195. That’s the price for the Aluminum model, mind you; a titanium variant will sell for a wallet-searing $1595. You can place a pre-order for the phone now, but RED says both the design and price are subject to change. You’d have to either be a tremendous RED fan or quite affluent to pre-order a phone we know so little about, but you do you.